The Irish Republic's economy has fallen into recession after shrinking for a second quarter in succession. The Central Statistics Office (CSO) said gross domestic product (GDP) had contracted by 0.5% in the three months to the end of June. The economy had shrunk by 0.3% in the first quarter of the year. Technically, a recession is defined as two or more successive quarters of negative growth. It is the first time Ireland has experienced a recession since 1983. The economy is now facing its most difficult period since high unemployment and emigration hit in the early 1980s. 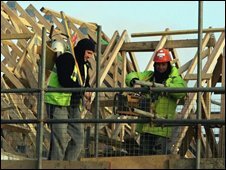 Economists pointed to the collapse of a decade-long bonanza in Ireland's property market, coupled with a slump in construction activity. The global credit crunch has also been a factor behind the rapid economic slowdown. It means Ireland is the first eurozone economy to slip into recession this year. Earlier this month, the Economic and Social Research Institute predicted the Irish economy would contract by 0.4% over the year after growing by 6% last year. Dermot O'Leary, chief economist at Goodbody Stockbrokers, said: "We have acceptance now that the economy is in recession in 2008. The issue is whether it will improve in 2009. "One thing we know for sure is that investment spending is going to continue to act as a drag on the economy in 2009, particularly on the house building side. "We know also that the labour market is deteriorating - so that is going to affect consumption spending. So it does not look like it is going to be a V-shaped recovery." The Irish data showed consumer spending in volume terms was 1.4% lower compared with the same period of the previous year. Capital investment was also 18.8% lower in the quarter compared with 2007, with significant declines in house building as well as in the acquisition of transport equipment and machinery. Industrial output was ahead by 1% on the same quarter in 2007. However, the output of the construction sector fell by 12.2% over the same period. "Other factors at work include higher commodity prices, global financial market problems, weak demand in our major trading partners and adverse exchange rate movements." The country has enjoyed a boom since the late 1990s, with multinationals arriving to take advantage of one of the lowest corporate tax rates in Europe. Bloxham Stockbrokers chief economist Alan McQuaid said:"Although the domestic side of the economy is contracting at a significant rate, the external side - the multinationals - is holding up quite well, but one would have to question how long that's going to last."